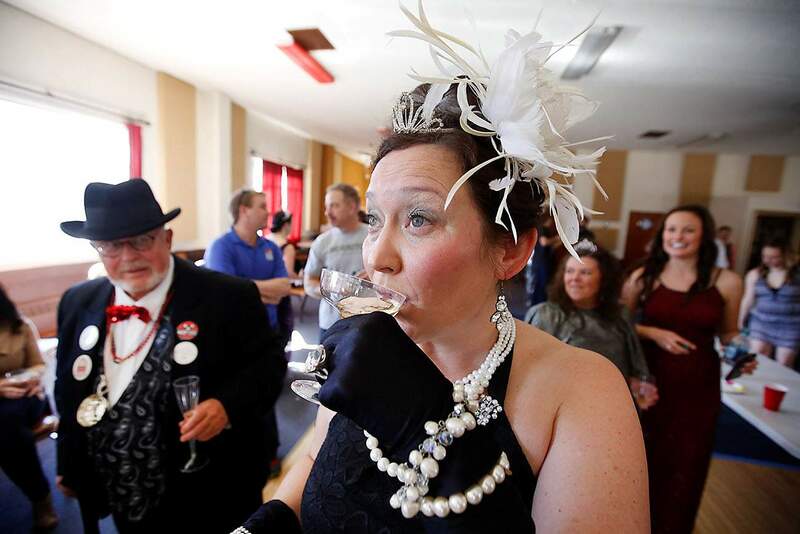 Leah Deane had to drink a glass of champagne Friday during Snowdown 2018’s “Champagne Pong” at the Veterans of Foreign Wars Post 403. 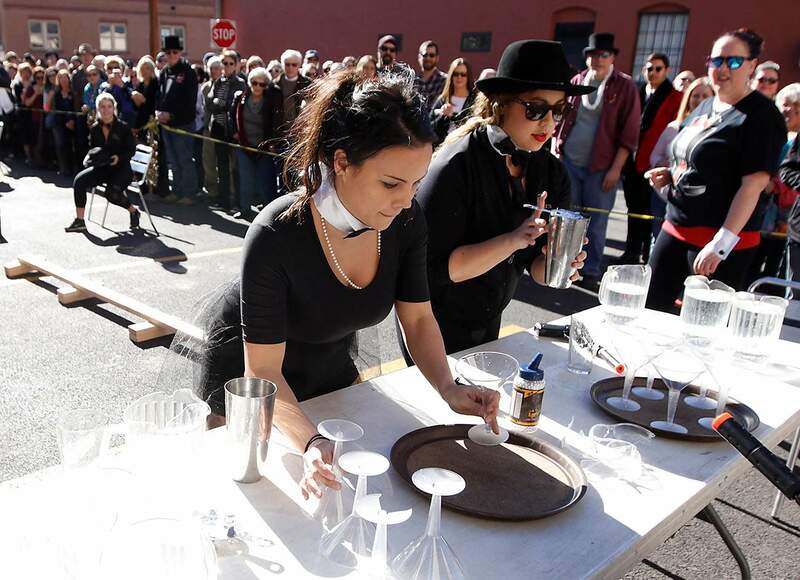 Jessica Fields of the Diamond Belle Saloon, left, and Madeline Tovar, of Ken and Sue’s Restaurant, mix drinks and then try to walk a balance beam Friday during the 2018 Snowdown “Waiter/Waitress Race” at Steamworks Brewing Co.
Waiter/Waitress RaceCoed teams of servers from Durango’s favorite local restaurants competed in an obstacle course combining balance, speed and style outside Steamworks Brewing Co. to determine the town’s most efficient wait staff. Cue “Eye of the Tiger” and other dramatic, mood-setting music. Ken & Sue’s Restaurant dominated the competition, completing the course in 00:01:45 with no penalties. Hoody’s came in second, followed closely by Purgy’s in third. Snowdown Champagne PongWe all know the saying, “It’s five o’clock somewhere,” often used to justify day drinking. Snowdown is as good an excuse as any to throw out your morals and indulge in libations, as those who participated in champagne pong at the Veterans of Foreign Wars Post No. 403 know all too well. Like beer pong but classier, the game attracted 70 people who took turns tossing table tennis balls into tiny glasses of champagne. The Wine Shop provided 80 bottles of champagne for the raucous fun.